Dr. Jeremy Jones was born in Midland, TX, but grew up in Houston. He returned to West Texas where he earned his Bachelor of Sciences degree from Texas Tech University. He then moved to Philadelphia and completed a Master of Science degree at Drexel University before returning to Lubbock where he received his Doctor of Medicine from Texas Tech University Health Sciences Center (TTUHSC). Following his medical education at TTUHSC, he completed an internship in Internal Medicine at TTUHSC prior to moving to Dallas where he attended University of Texas Southwestern for residency training in Physical Medicine and Rehabilitation. He then again returned to TTUHSC for fellowship training in Pain Medicine in the Department of Anesthesiology under Drs. Miles Day and Gabor Racz. Upon completion of his training, he joined the faculty at TTUHSC serving as an Assistant Professor in the Department of Anesthesiology and Pain Management where he helped to educate medical students, residents, and pain management fellows. He is excited to now be a part of the team at Lubbock Spine Institute. Dr. Jones is now happy to call Lubbock home. He is married to Dr. Catherine Jones who is a medical oncologist. They have four children, Ryan, Graham, and twins Reed and Grant. He enjoys spending time with his family, building/construction, and of course his Red Raiders. 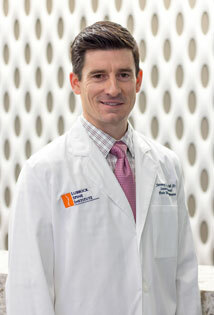 Dr. Jones has a broad medical expertise that allows him to treat disabling conditions and focus on patient function. His professional interests include musculoskeletal medicine, ultrasound and fluoroscopically guided interventional pain management, neuromodulation, and nerve conduction/EMG. He is board certified by the American Board of Physical Medicine and Rehabilitation with added certifications in Pain Medicine.